Discussion in 'RPG Maker MV School' started by Touchfuzzy, Sep 9, 2017. With our Back to School sale starting, we have decided that now is the perfect time to debut a brand new, long term shared project for our forums! The RPG Maker MV School! So what is the RPG Maker MV School? 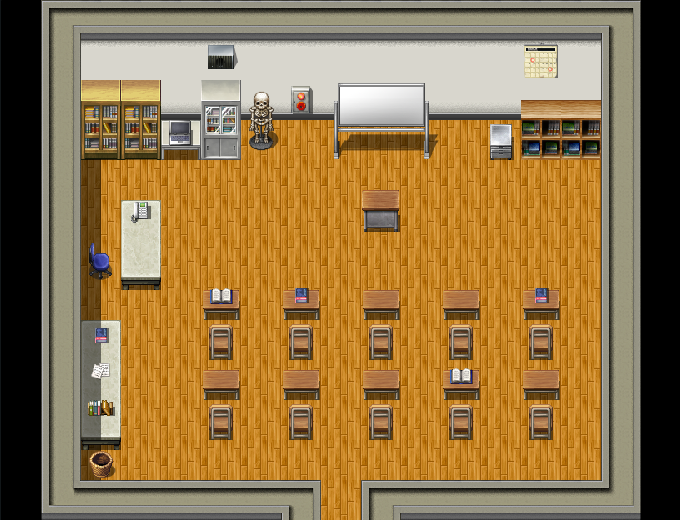 This project is a game made with RPG Maker MV about a fictional school ran by yours truly, Touchfuzzy, with his much more useful assistant principal Lunarea. The school is a nexus of time, space, and dimensions, which means that anything can show up there, it grows as it needs to, and different floors can be themed in entirely different ways, but the main thing that will show up is people from the community! The pointing of the game is to teach people how to use RPG Maker MV. It teaches people how to event, or how to create battles, or any number of other skills. But this project isn't going to just be made by me, it will be made by the entire community! Anyone can work on a lesson and if we feel that the quality is high enough, it will get incorporated into the main project. Things will open up for lessons next week, so get your brains running on what you want to build! For the structure of the lessons, remember, you get to be the teacher in the game, and you will have your own classroom (or share one with someone doing similar lessons! ), and the player is playing a student. Also, stories in your lessons are always a bonus, as it keeps the player engaged! Don't feel like you can make a lesson? Maybe you don't have the time, or you just feel you need to do some more learning first (that's what we're here for), you can still be part of the fun, and this part is open right NOW! Currently, our poor school is pretty empty. Touch is all alone for the most part with the Student. So we need other students and non-teacher school staff (Secretary, Janitors, etc.). 3. A "Default Line" for what you say when the Student talks to you when they aren't in a lesson. 4. An explanation of your personality for people making lessons. People making lessons can always ask you to help them write your lines if they want to have you say something else to incorporate you into their lessons, but you should include a description thorough enough that hopefully they can do it themselves. So get started planning your lessons. Get your NPC character pieces up, and be prepared when the base project lands next week! KimiRaven, CaptainRadish, Infinitea and 32 others like this. Can you elaborate a little more on how our lessons should be structured? Should they be general or very specific? 1 question: Can we create a weird/medieval NPC's or is it all normal schoolboy/girl type of characters ? The lessons I'm doing myself are 1. Basic intro to variables, switches, and conditional branches (this is the school "orientation" which people can skip if they want), 2. Using RegionID in events. 3. Creating a basic stealth system, 4. Something that combines everything from 1-3 into one giant "test"
On the subject of NPCs: NPCs added have to represent you specifically (it is about filling the project with people from the community), but within that mold, you can use any theming you want to (as long as they are not characters from existing IPs, don't want to deal with that). As stated, the school exists at a nexus point of time/space/dimensions. The story for the lessons I'm writing is actually very scifi for instance. The first floor is the only floor that will necessarily even look like a school. (Other floors might be cave themed, castle themed, etc. The school is kind of like Draculas castle from Castlevania, it just makes what it feels like). Titris Thrawns, Seacliff, JosephSeraph and 3 others like this. Waah~ that's such a great idea! I see if I can come up with something that would be fitting. Where do we submit all our stuff for the NPC's? so, for those of us who may be interested in teaching a lesson, are we to create our lessons in a new project file and then hand over the project folder upon completion? how will you actually incorporate our lessons into the main project? Mirpono But what do I know? Oooh this sounds fun. I've got an idea for a cool(...maybe) event that I made, but never used. This is cool I'm still pretty fresh on what newcommer questions since a friend of mine just got MV. Though, I second dbchest. Do we start a new project file and send over an encrypted version when event opens? I'm loving this idea! I've already got a few ideas of things I could teach. I might get in on this once I see the base project. Really cool idea. Interactive tutorials are a great way to learn. @Touchfuzzy And what about PIXI? That one is not a plugin. It's integrated into the game and plenty of stuff can be done in the editor using the script command. I would love to make a class about PIXI, showing even to lower skilled people that it can be a viable alternative to default things in the editor and even plugins! Nothing overly difficult of course. Have fun sharing your stuff guys! starlight dream, dbchest and Marquise* like this. Awesome stuff. I'll work on something after this weekend. My partner and I absolutly love this idea, and me personally, would love to take some part in this. The two of us want to know if we can make our NPC characters and have them be the janitors. Is that possible? Or is the position taken?? That sounds super duper fun! I think I might make some graphics-related tutorials. Maybe drawing tutorials but also how to use bust graphics and control / animate them with common events, using color to your advantage when composing scenes, etc ! !